To begin forex trading, I actually had no idea what it was about so it was somehow weird how it is possible to make a cumbersome money trading online through a broker. As you already know by now, forex trading involves two aspects; that's the Fundamental and Technical Analysis. It took me about a month to get to really understand what the fundamental analysis was all about and what it entails. I am now working on the technical analysis and also developing my own trading strategies to start trading real account. Well today, I did enter into some few trades and a lot didn't turn up the way I wanted it to. As a newbie, I was just entering into the trade whenever I saw a bullish candle form without taking into consideration what might happen next. I will be talking about how I used the Relative Strength Indicator in my trade today. In one of my trading today, I placed a sell order when the RSI crossed the 70 reference line(overbought) region but the price chart continued to go uptrend which triggered my stop loss profit. Some of you might be wondering why this happened. I got to realize later that, it is not always right for you to sell when the RSI reaches the overbought region and not always buy when RSI reaches the oversold regions. These are some of the common blunders newbies in forex trading commit in forex trading. In my next article, I will be talking about how to apply Bollinger Band indicator in forex trading and also about the implications of applying the Bollinger band in my trade. Drop a comment below to appreciate the author. 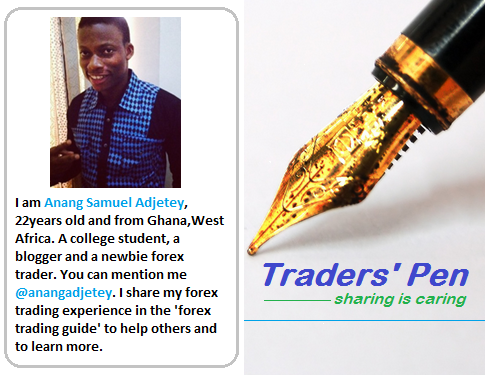 Thanks for sharing your trading experience. It’s very helpful for the beginners. In order to reduce the trading risks and save the capital, there are simple, but effective steps, like choosing the broker profile at broker reviews website, reading trading conditions on brokers’ site, trading om demo account ect. Don’t forget about education, you should what influence on the market and analyze the trends. Long story short – learn how to trade and always keep in mind that such financial markets are unstable.